Late Summer Nectarines are currently cheap, abundant and very sweet. Rich in vitamins A, C and E they are a great source of dietary fibre and potassium and worth stewing and freezing if you can buy boxes cheap to use through the coming colder months. This week we share a special recipe for special occasions. To make the pastry, place the flour, almond meal, icing sugar and butter in the bowl of a food processor and process until mixture resembles fine breadcrumbs. Add the egg yolk and process until dough just comes together. Shape into a disc and cover with plastic wrap. Place in the fridge for 30 minutes to rest. Use a rolling pin to roll out the dough on a lightly floured surface to a 3mm-thick disc. Line the base and side of a 22cm-round fluted tart pan with removable base with the pastry and trim the edges. Place in the fridge for 30 minutes to rest. Preheat oven to 200°C. Line the pastry with baking paper and pastry weights. Bake in oven for 10 minutes. Remove the paper and weights and bake for a further 10 minutes or until golden. Remove from oven and set aside to cool slightly. Reduce oven temperature to 180°C. To make the frangipane, use an electric mixer to beat the butter and caster sugar until pale and creamy. Add the egg and egg yolk and beat until just combined. Add the almond meal and flour and stir with a wooden spoon to combine. Spoon mixture into the prepared pastry case and use the back of a spoon to smooth the surface. Arrange the nectarines over the frangipane. Sprinkle with caster sugar. Bake in oven for 30 minutes or until frangipane is set. Remove from oven and set aside in pan to cool completely. nectarine, (Prunus persica variety nectarina), smooth-skinned peach of the family Rosaceae, known for more than 2,000 years and grown throughout the warmer temperate regions of both the Northern and Southern hemispheres. In tree shape and leaf characteristics the peach and nectarine are indistinguishable, but nectarine fruits look more like plums than peaches because of the smooth skin. The stones and kernels of the two fruits are alike in appearance. 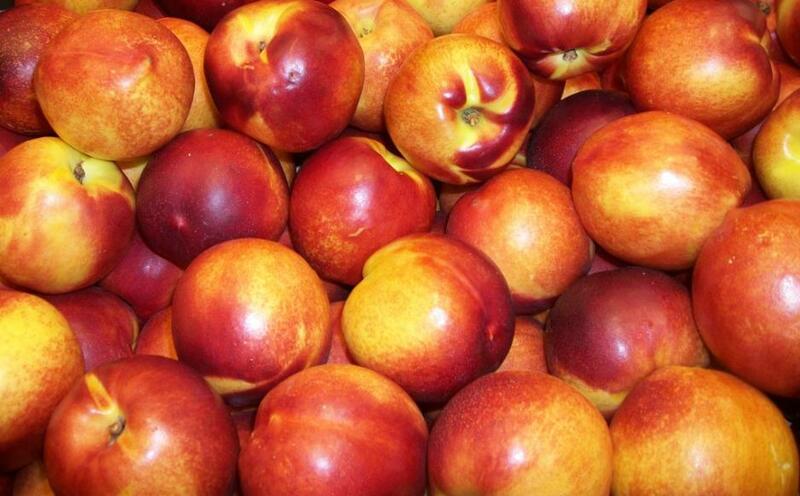 Nectarines have red, yellow, or white flesh.